National Seeds Corporation is providing a big opportunity to all Indian candidates to grab a Government jobs in India. Before explain about this National seed corporation recruitment 2018, we first going to explain little a bit about this Government owned organization under Government of India. National Seeds Corporation Limited under the administrative control of Ministry of Agriculture & Farmers Welfare, Department of Agriculture Cooperation & Farmers Welfare is an apex body engaged in production of quality seeds and distribution, invites online application from Indian Nationals for filling up the following posts on direct recruitment basis at Corporate Office (New Delhi), Regional Offices (at 10 different locations all over India) and Farms (located at Rajasthan, Haryana & Karnataka). Below we are going to explain each and every aspect about this Government job opportunity under National seed Corporation of India. Total vacant Posts: 78 posts. Age Limit: Maximum age limit not exceeding 23 years as on the date of closing of online application. Pay Band: One year training. Consolidated stipend of Rs. 22748/- per month (Basic Pay Rs. 22000/- & DA Rs.748/-) during training period plus HRA or single seated accommodation depending upon the place of posting. Scale of pay on absorption: Rs. 22000-77000/-. Departmental candidate having higher qualification joining in a lower post will be eligible to apply for high post after completion of Bond period even if the course completed is through correspondence or distance education. If an employee has acquired higher qualification before joining NSC or acquires higher qualification with prior approval during his service period, he will be eligible to apply for higher post after completing four years service, even if the course is through correspondence or distance education. Note1: Age relaxation/reservation for SC, ST, OBC, Ex-servicemen & PH will be applicable as per Government Rules & Guidelines. Education: Those who are looking to apply above job profile under this National seed Corporation recruitment must have following education qualification: “ Bsc(Agri. ), B.Tech, BCA, MBA, MSc(Agri. ), M.Com, Graduates(All Stream), Post Graduates, Diploma Holder, ITI Pass” can Apply for these Government Jobs in India. Mode of Selection: For the selection of candidates as a Management Trainee, Sr. Trainees, Trainee and Trainee Mate, the National Seed Department is going to conduct a Written examination Based on the merit of written examination, candidates will be called for interview and document verification Taking into together written examination and interview marks the candidate will be finally shortlisted for selection, if everything is found in order i.e. documents/certificates. The weightage of written examination will be 70% and interview 30% for final selection merit list. Application Fee: All Indian applicants who meet with the above eligibility criteria can apply for these Government jobs in India, before applying online they have to pay the application fee for the written examination. The fee for the written examination is as follow: Rs. 500/- plus Rs. 25/- as processing fee to be paid online only for General Cat. Candidates, while SC/ST/PWD candidates need not to pay anything for applying this National Seeds Corporation recruitment 2018. 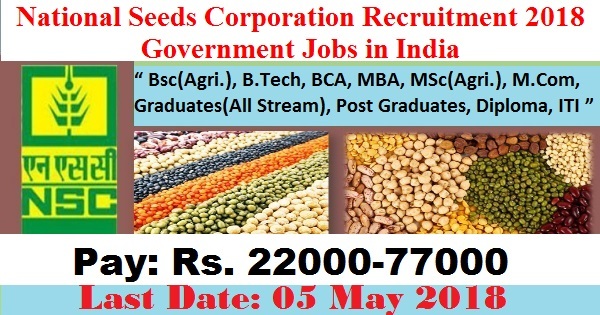 Those who are wishing to apply these Government Jobs in India under NATIONAL SEEDS CORPORATION have to apply online through the official website of the department. In Important Link section of this article we share the direct link for online application form. You have to just click on that link for online form. The link for applying online will be activated on 14th April 2018 and will end on 5th May 2018. Candidates have to apply in between these dates only. 14TH April 2018 is the Starting Date to apply. 05th Mat 2018 is the Last Date to apply online.